Normally shooting twice just to be sure is a good idea, but in this case you’re just going to undo your progress. That’s because this lamp doesn’t turn on by means of a switch, clapping sound or tap—you have to shoot it, bringing a whole new meaning to the phrase “kill the lights.” Designed by the Japanese design company bitplay, the Bang! 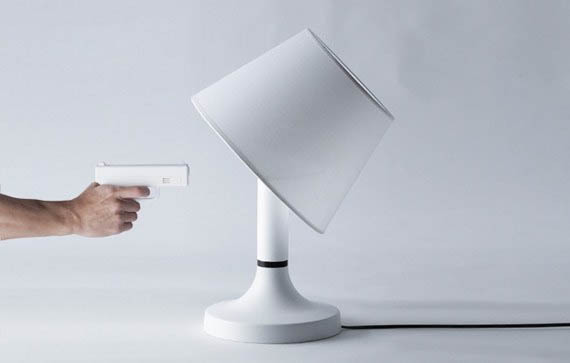 Lamp comes with a matching gun, and when you shoot it the lampshade tips over as if it’s been shot. While I’m not typically the type of person who keeps a gun at my bedside, I think I can make an exception this time. Actually the company is from Taiwan and their products all say explicitly “designed and made in Taiwan”. The lamp was featured on the Tokyo Design Week (something like that) and there is a Japanese importer. The original product however comes from Taiwan. Cool thing you found there. But with the price around 279 Dollars it is a little bit expensive..